Custom Foot Orthotics is extremely helpful in providing relief for painful foot problems or during/after an injury and are particularly helpful to those who must walk, or stand on the job or in every day activities. Normally, when viewed from the front, the middle portion of the feet should have a well defined arch. When this arch flattens, it is called pronation or flat feet. 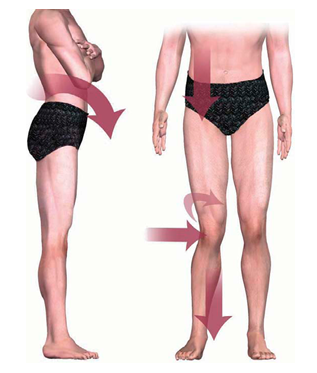 When on one side, it will typically, cause the hip on the same side to be lower and when on both sides, can cause the knees to hyperextend and the hips to move forward leading to a swayback. Both of these conditions will lead to further, abnormal compensations throughout the body. From a very common-sense, mechanical point of view, the only way you can effectively control the foot is to apply a force directly up under the arch. The reason we can now do that comfortably is modern plastics. The goal is to create a custom, supportive platform for each foot that is rigid enough to achieve the arch up state, yet flexible enough to allow some small degree of flattening for shock absorption, terrain adaptation and comfort. 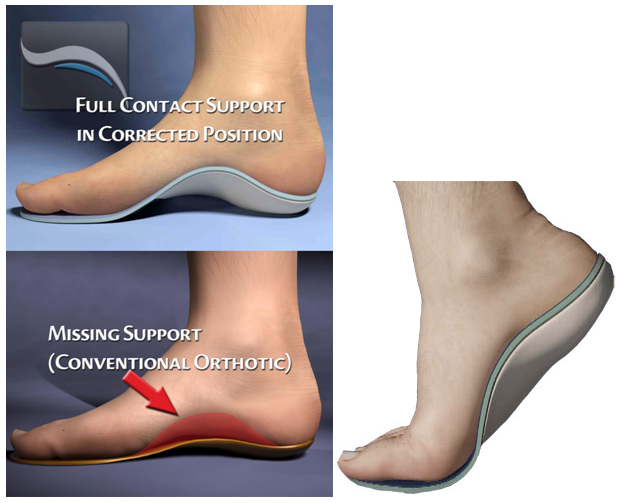 Taking this into account, our orthotics are made from a semi-rigid, memory plastic material that will act as a foot support, not as a foot brace, which is so characteristic of some of the hard non-rigid orthotics that are still available today. To do this we have to know how much a person weighs, because bigger people need more support. We also need to know how flexible their foot structure is, because floppier feet need more support. Throw in what kind of activities a person is used to doing and now we have some real custom information to make a device that can control their feet. They are lightweight, extremely comfortable and easily transferred from shoe to shoe.